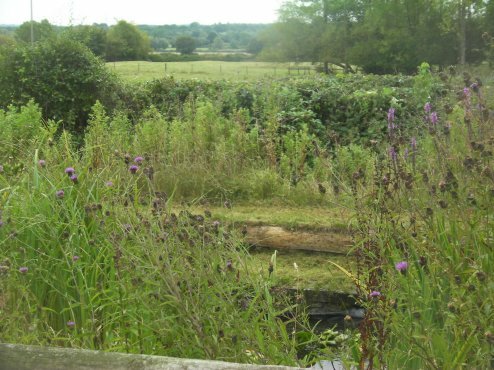 The Head at Oaksey Primary School invited Grassroots to offer some suggestions for their defunct overgrown and broken pond structure. There was very little funding available but one of the school's governors; Ian McNaught Davis, offered a range of building materials to help with the redesign. The site was a scene of wild thicket, brambles, thistles and nettles choked the upper section. The pond liner had punctured and held no water and the steep sided pond made traversing its banks difficult. Grassroots head of design, Lester Manners, needed support from the school staff and parents to clear the area, before a full survey could be administered. With hook and sickles, spades and shovels, a reckless bunch arrived one saturday morning to set upon the mammoth task of clearing the jungle! Six hours later, hands bleeding, weight shed, clothing smeared with chloroplast, the area to be reconstructed was revealed. A mighty task lay ahead! The design had to deal with three issues: EDUCATION, CHILD FRIENDLYNESS, WILDLIFE FRIENDLYNESS. The headmistress, Ursula Scott, wanted the children to beable to pond dip safely, whilst under the tuition of various wildlife figureheads. 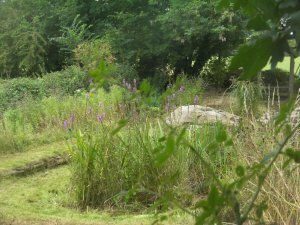 The school is regularly visited by the Wiltshire Wildlife Society and so to make best use of their professional lecturers, Lester designed terraced grass seating around the newly built pond which had a maximum depth of half a meter. A grass path safely direct's the pupils to their seats and the lecturer is able to conduct studies from anywhere around the pond. A catchment basement filters rainwater into the pond and doubles up as a hard path to a timber shelter beneath the boughs of some mature ash trees. At the far end and surrounding the perimeter of the pond, is a planted flower meadow. 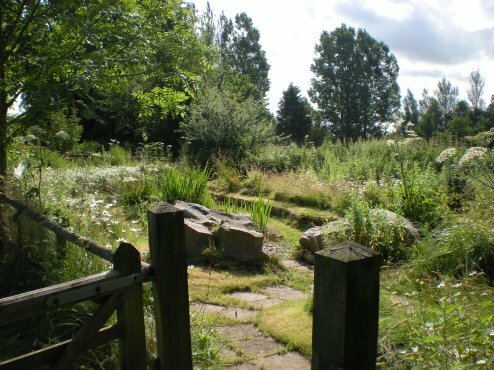 Planted to attract a wide array of insects, reptiles and amphibeans. A tall overgrown hedge was laid in the winter to allow more sun into the site and spring bulbs were planted all over by the school's children. The pond is in it's eigth year of existence and has been visited by hundreds of wide eyed children. 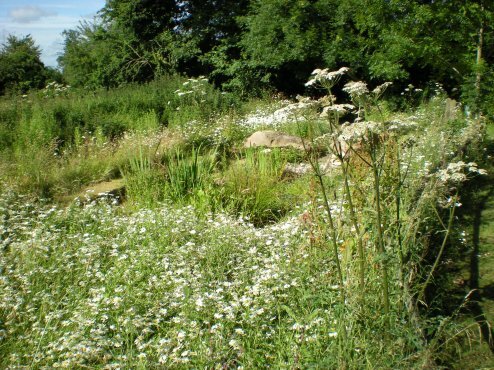 It has provided the habitat for hundreds of newts, frogs and other reptiles and amphibeans. Dragonflies hover over the water in the summer and larger mammals have been seen drinking from the pond. A group of parents volunteer under Lester's stewardship to come and mow the grass and to cut the hay from the meadow. "A most marvelous resource, one that we could not possibly do without." A quote from the head governor.